The CRL Commission says pastors who claim to stage miracles, defy the laws of nature by alleging that they can resurrect people from the dead, do so to mislead people into giving church leaders money. This follows an incident in which a Johannesburg based pastor claimed to have raised a man from the dead on Sunday. 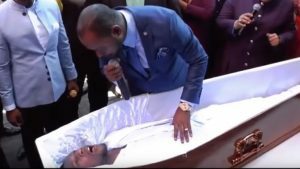 A video showing Pastor Alph Lukau of Alleluia Ministries has gone viral on social media – after he claimed to be praying for a dead man who then resurrected. The funeral parlour, whose vehicle was used to ferry the alleged deceased man to the church, has labelled the incident as a ‘hoax’. The post CRL accuses ‘resurrection’ pastor of misleading public appeared first on SABC News – Breaking news, special reports, world, business, sport coverage of all South African current events. Africa's news leader..